What To Do Before Your Surgery - planning ahead can make coming home a delight! What to do before your surgery? plan your own coming home party! What to do before your surgery depends on how you want to cope with coming home. Many people find peace and comfort in a clean, orderly and organized home. This peace provides healing and rest for a healing body (with or without surgery!). Plan your own situation for coming home and avoid the stress of a haphazard home. Picture what you want to come home to and start putting things in order now - even if that means hiring someone to help you - your body and rehab process will thank you. Trying to figure out what to do before your surgery can depend on your surgery, your hospital stay, if you are going to a rehab center for a few days or weeks. Begin a list now based on your estimated time away from home. Your list will also depend on the help you have when you get home. Do you have a spouse, a family member, a cook, etc? All things to take into consideration. I've compiled two lists of things to remember to do before your surgery based on what your time span plan is for coming home. Plan ahead but don't stress it. If you need other ideas for what to do before your surgery, contact some friends who have had the same surgery. Will you be using a walker, wheelchair or crutches when you come home? Be sure that pathways to the bathroom, bedroom and kitchen are clear and wide for added maneuverability. Remove small hand grenades - small rugs that can cost your another trip to the hospital! Consider these things to do before your surgery if you plan to come home a few weeks or months later. Take into consideration the items listed above while considering what to do before your surgery. A longer time away will require some forethought to prepare for an increased time away from home. Use your good judgment in deciding what to do before your surgery. The above lists are incomplete for every situation but can provide a good base to get you started and thinking for your specific situation. And, before you go, Godspeed and God bless - connect with a spiritual mentor to help you through and give you a place to connect and grow in your faith when you are back on your feet again! Surgery is no fun but sometimes necessary. Keep focused on your rehab and listen to your physical therapist! If you are expecting Home Health Care when you come home, find out what you should expect from your home health physical therapist below! Get our free Breaking NewsNotes ezine for up to date information when it's important enough to break in! No cost to you! 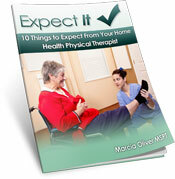 Sign up for your Do-It-Yourself Home Health Physical Therapy newsletter below at no cost and receive EXPECT IT! for free.